A man is in custody after an explosion Monday morning in the subway under the Port Authority Bus Terminal that has been called "an attempted terrorist attack." Five people suffered minor injuries and a man is in custody after an explosion in the subway under the Port Authority Bus Terminal in Manhattan that Mayor Bill de Blasio called "an attempted terrorist attack." A pipe bomb affixed to the suspect with Velcro straps detonated at about 7:20 a.m. Monday in the passageway between subway lines that runs a full city block under 42nd Street between 7th and 8th avenues. The bomber, according to police, is 27-year-old Akayed Ullah from Bangladesh. He is now in a New York City hospital with burns to his arms and torso and other serious injuries from the blast. Investigators said he had a homemade pipe bomb strapped to his chest when he detonated it in a crowded subway corridor. Port Authority surveillance video shows the moment the blast happened: Monday commuters, the morning rush hour, then an explosion. People ran as the smoke cleared, and in the haze the suspect is visible on the ground. He is the only one seriously hurt; the pipe bomb, wired to a battery pack, only partially detonated. "If I don't believe in no God, I believe in God today. That's the only thing I could say," said witness Christina Bathea. Police on the scene in the immediate aftermath of the attack scuffled with the suspect before taking him to custody. He is being treated at Bellevue Hospital. Four civilians suffered minor injuries. 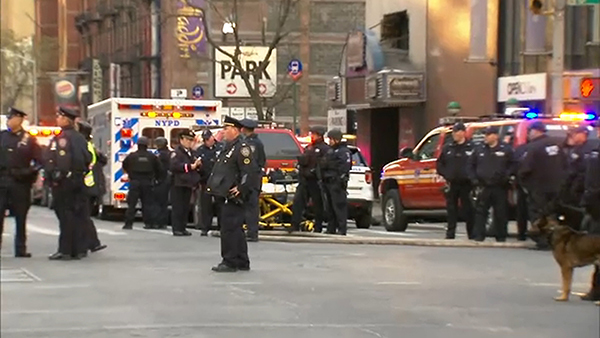 "Preliminary investigation at the scene indicates that this male was wearing an improvised low-tech explosive device attached to his body," NYPD Commissioner James O'Neill said. "He intentionally detonated that device." "This was an attempted terrorist attack. Thank god the perpetrator did not achieve his ultimate goals," Mayor de Blasio said. According to New York City police, Ullah is a Bangladeshi national living in Brooklyn, who came to the U.S. in 2011 on an F-4 family visa. Police said he now has a green card and is a permanent resident. A few years ago he worked as a New York City livery driver. Police are searching his apartment, where they say the bomb was made. "He wasn't friendly at all. The family was very quiet, to themselves, they don't talk to nobody. You know, they just stay there," said neighbor Alan Butrico. Law enforcement officials said Ullah was aroused by ISIS and that he followed bomb-making instructions on terrorist websites. "The last two instances for New York, both of them went on the web, downloaded information. They must have been looking at a number of these types of websites and that is where they are getting their information," New York Governor Andrew Cuomo said. As the I-Team first reported in 2010, Al Qaeda instructed would-be jihadists to "make a bomb in the kitchen of your mom," and a year ago the ISIS propaganda magazine was encouraging bomb attacks on commuter transit system. Inspire Magazine also prominently featured Chicago's own Gold Coast skyline, encouraging jihadists to attack on their own. "What I can tell you, and what I think is important, is that there is no credible threat to the city of Chicago, said Alicia Tate-Nadeau, executive director of the Office of Emergency Management and Communication. While the director of OEMC repeated the standard Chicago City Hall mantra regarding terror threats in the city, there was also no credible threat in New York before Monday morning's bombing or the bike path attack by a terror suspect in October. "If somebody has the will and they're ready to die, there's absolutely - it's not possible to say that it is impossible," said Special Agent in Charge Jeffrey Sallet, FBI Chicago. Sallet spoke to the I-Team in November about the city as a terror target. "A line I often use in counterterrorism is 'vigilance is the price of freedom.' When we forget and we do not think that something can happen is when bad things do happen and so we need to be prepared," he said. Cuomo said Ullah's apparent motive was he was "angry." Cuomo asked New Yorkers to be alert but go about their lives. "Let's go back to work," he said. "We're not going to allow them to disrupt us." The bus terminal was temporarily closed but later re-opened, and subway service was disrupted throughout the morning but has since returned to normal with delays. Authorities confirm the bomb squad searched for a second possible device, which is normal procedure after an explosion. The White House praised the first responders at an afternoon news conference: "On behalf of the President and a grateful nation, we would like to thank them and commend them for their bravery." Chicago police said Monday morning that there are no credible threats to Chicago. As a precaution, Superintendent Eddie Johnson has increased patrols around CTA, Metra rail and major transit hubs. Anyone who sees anything strange is urged to call 911. WABC-TV contributed to this report.